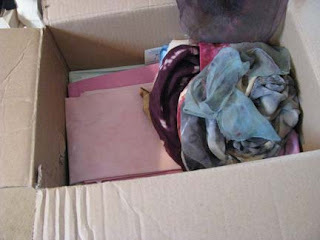 A pile of silk sheers that have been dyed with either cochineal and or indigo. 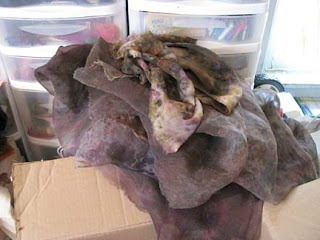 Compost dyed silk fabrics, mainly sheers, that'll end up as faerey shoes or dresses - I think. 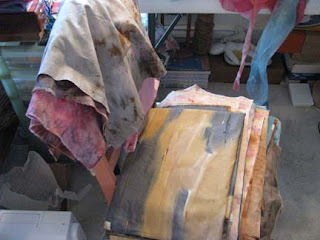 Found my pile of immersion dyed cotton fabrics, to the left, dyed with natural dyes. 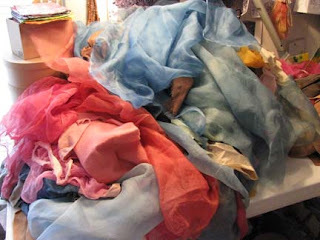 A selection of silk sheers to the right that have been dyed using a variety of methods, compost dyed, screenprinted (with natural dyes) or bound resist (shibori). Seeing the dark burgandy fabric reminds me that I wanted to get back to the dye pots and do some overdyeing a great way to make hohum fabrics SING! 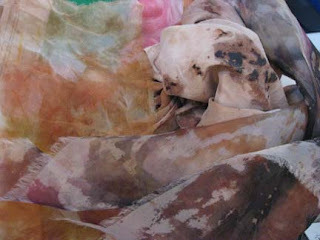 Dye painted, Bound Resist, Compost Dyed, Silk Sheer Fabrics. Like what else am I going to do? I had planned on working in the front garden this morning but over slept and woke up to rain! So now I'm back to sorting and pressing art cloth and will list some on my prairiefibers.etsy.com store later this evening. I have way too much fabric, and fibers, at this point and some of it definately needs to go live some where else.